The unit can be easily and quickly set to crosscut, bevel mitre or rip, providing versatility in many applications. Simple yet positive controls and angle cut to be set with accuracy in seconds. 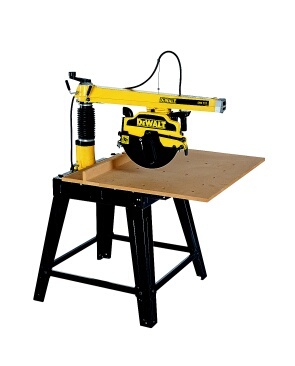 The DEWALT radial arm saw is one of the most accurate, versatile and easy-to-use woodworking machines available and the fact that the radial arm saw is easy to use, extremely robust, highly reliable and is fully adjustable to maintain accuracy throughout its long life. 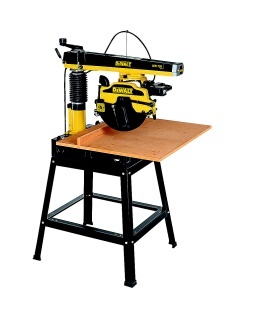 It is easy to understand why DEWALT radial arm saws will always be so popular with professional woodworkers. Free standing radial arm saw with 610mm of crosscut capacity, 870mm of rip capacity and 90mm depth of cut. Strengthened column assembly and base arrangement supports the extra arm length. Solid cast iron arm and four roller bearings in the motor head assembly ensure high accuracy and durability. Quiet maintenance free induction motor delivers high power even at the maximum cutting capacities of the machine. Simple yet positive controls and adjustment scales enable the width, depth and angle of cut to be set with accuracy in seconds.